Thank you so much to Wolfson Creek Farm for growing beautiful, well cared for animals! 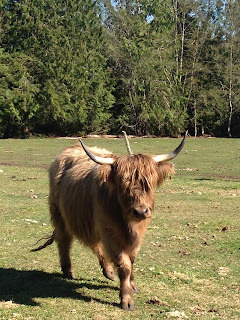 Patches shared some organs from organically raised Highland cattle yesterday morning. Cannot get any better than that! Melt a couple tablespoons of the fat in a sauté pan. Over low heat, slowly cook the onions with the sliced liver until no more blood comes out of the liver. Add the garlic, brandy, mustard, mace, rosemary, thyme & ginger with its juice. Cook briefly. Allow the liver to cool a few minutes then place in your food processor. Melt the rest of the fat in the pan and add to the food processor in a slow stream. Process until very smooth. I transferred this pate into small mason jelly jars. If you are not going to use right away, melt a little butter to pour on top to cover the pate, cap and freeze until your next party!